Tough Lures Peacock Bass Association with fishing trips to the Amazon for peacock bass anglers. Real time weather reports for 10 top peacock bass destinations. Most of the giant lures with which anglers go after peacock offer strong hooks and hardware, but don't take that for granted. A 25-pounder can wreck almost any bait under some circumstances. That's particularly true of a "worn" lure that has caught several fish already. Eye screws cannot take a "rebending" without losing most of their strength. Smaller, bass-size lures usually need to be beefed-up. I can certainly recommend Andrew Taylor's Stamina Quality Components for all your needs to make your lures "Peacock ready". The PBA Supporting Member offers a complete source of lure hardware, including heavy-duty hooks, split rings, screw eyes and a bunch of other useful items. Stamina offers the best Split Ring Pliers I have ever seen; I use them almost daily when I'm on the water in peacock country, and before each journey. Check out his website at www.staminainc.com or call them at 1-800-546-8922. I also change out most all of the hooks on most minnowbaits and other lures that run deeper. In general though, submerged bait does not have to carry as big or as strong a hook as does a topwater plug, in my opinion. For example , a 3X 2/0 might work on a big minnowbait, but a 6 to 7-inch topwater would need the 4X 3/0 or even sometimes 4X 4/0 in the front position. Peacocks don't seem to be able to get the same leverage on a submerged lure as they can on the topwater plug. "Painting Up Some Lures At Home"
Friend and avid peacock bass angler Greg Thompson has what he calls his "secret weapons" that he puts a lot of work into. He'll paint his topwater baits to his liking and even add eyes to the lures. 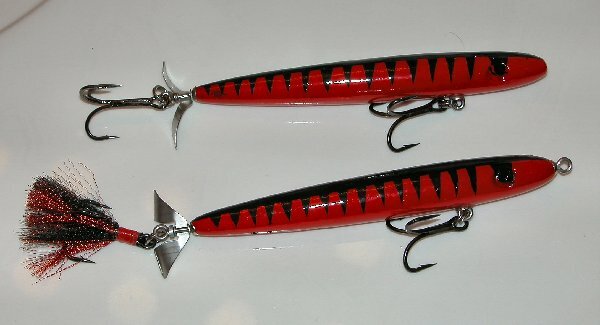 Some of the other Peacock Bass Association members paint some of their own plug bodies before their trips as well. Another thing that Greg does is to "Spike It Baby". Notice the blades. They are colored with the new Spike It blade dye. The giant peacocks don't stand a chance against such fierce looking plugs. The plugs are beautiful and the hairpiece on the tail gives them an added interest perhaps. New Hooks For Peacocks Long-time Supporting Member T.J. Stallings of TTI-Blakemore Fishing Group (Daiichi Hooks) has a couple of new Daiichi products just out that should make peacock anglers better fishermen. Want hooks that won't straighten out from the freight train-like power of a 25 pound peacock? Then, change out your lure's factory hooks to the Daiichi 7X strong Bleeding Bait trebles. They come in sizes up to 2/0 which are just right for those oversized minnowbaits, crankbaits and mid-size (4 to 5 1/2 inch long) topwaters. They offer the super sharp points that Daiichi is famous for. Also, some angler will want to visit the Daiichi page in our Directory under Products and Services at http://www.peacockbassassociation.com/html/daiichi_hooks_peacock_bass.html and study their "Stoopid Rig." The concept is one they have promoted for 2 or 3 years now, and I think it is just catching on for peacock bass anglers. 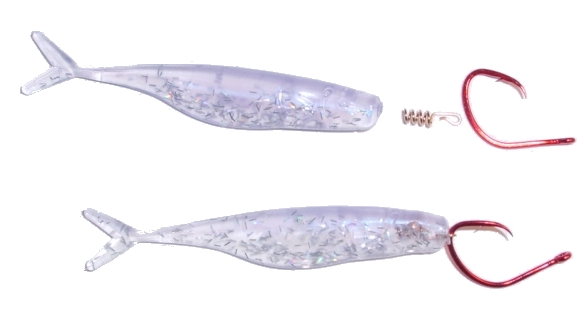 Their new Bleeding Bait Octopus-Wide hooks in sizes of 5/0, 6/0, and 7/0 and some large-size HitchHikers should be in every traveling angler's tackle box, according to some "insiders". All rights reserved © 2001-2016 Larry Larsen. No part of this website may be reproduced or transmitted in any form or by any means without permission in writing from the association. Factual information, names, addresses and telephone numbers are subject to change and often do. We have tried to bring you the most updated information available. 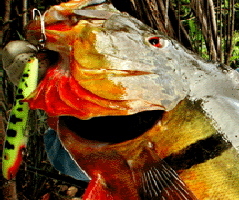 The Peacock Bass Association is not liable for problems associated with the reliability of information provided on our website or printed materials.